"Casualties of Devil's Night," by marcszar: the first picture to win three straight rounds in the Picture Contest and be entered into the SC4D Hall of Fame. The SC4 Picture Competition is a contest originally started by Masochist at SC4 Devotion as a way to showcase the best pictures of SimCity 4. Players enter pictures into the contest to be voted upon by the general user population, with the hope that their photo will eventually make its way into the SC4 Picture Hall of Fame. The game is noted for maintaining a fun environment while simultaneously being a place where only the highest quality works will flourish. It is currently one of the most popular threads on the site (in terms of views and replies), and has spawned multiple spin-offs and tournaments both at SC4D and at other sites. The Picture Competition was started in March of 2007 by Masochist. According to him, the inspiration came from the fact that he could not find a picture on Simtropolis that he had once looked to for inspiration, and had thought it might be a good idea for there to be an archive of exceptional SC4 pictures for users to look upon (this would evolve into the Hall of Fame). The contest was based upon a similar picture contest found in a magazine as a way to deem pictures "worthy" of entering the archive. Upon the game's creation, it was quickly moved from Forum Games into its own forum section by SC4D Admininistrator Jeronij, and Masochist was made moderator of it. Colyn helped give the game credibility with SC4D's user population, and it rapidly grew in activity. The Hall of Fame was created shortly afterwards, and the Marcszar earned a spot as its first entrant. A "Suggestion Box" was set up for users to give feedback, and a number of tournaments were held as derivatives of the original game. Rooker1 joined Masochist as a moderator of the game, and eventually took over the job completely (with aid from Thundercrack83 and the other admins). The rules have been altered and expanded throughout the competitions history, but the general concept of the game has been relatively constant: two people post a picture that they have created and the membership of the site votes for their favourite. The first picture to receive the required number of votes is the winner of that round. Alternatively, if twenty four hours pass and neither picture has won, the person who is ahead when time expires will win that round. In the event of a tie when time expires, the next vote will decide the round. If a picture wins three rounds in a row it is inducted into the site's Hall of Fame. 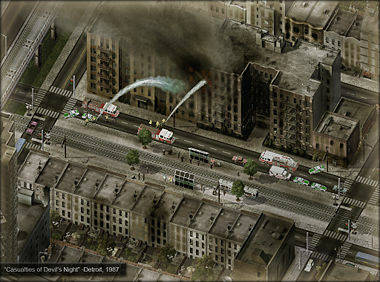 The content of each picture is irrelevant (so long as it was taken in SimCity 4), though general guidelines exist. The size limit of each picture is 1024x768, though 800x600 is the preferred size. Mosaics are not allowed in the main competition. Flash animations and .gif's are legal, but heavily altered pictures are highly discouraged. The process of casting a vote for a photo is as simple as stating the name of the picture's author and posting the correct score with your vote added in, but people will often go beyond this minimum and offer some insight into the reasons for their decision. These statements are often valued by the contestants as a way to improve their skills and test their styles. There have been a number of spin-off contests based on the original competition. One of the common ones are "Themed Tournaments," which users may submit a picture that conforms to a particular theme (parks, CBD's, etc.) to be voted upon by the general site population. The pictures with the highest votes continue on to the following rounds (however many are necessary) until one picture is finally chosen to be the victor and is inducted into the Hall of Fame. Also common at SC4D are "Tournaments of Non-Champions," or "Second-Chance Sunday" tournaments. These are tournaments in which a handful of past contestants in the main competition are chosen by the current game moderator to have another chance at the H.O.F. The voting process is identical to that of the Themed Tournaments: users are given a number of votes to choose their favourite pictures of the group, and the ones with the highest votes progress to later rounds until there is one victor. The winning picture is inducted into the hall of fame, and the pictures that made it into the final round are automatically entered into the next Second Chance Tournament. One noteworthy T.o.N.C. was held in honour of SC4D's 1st Birthday; four simultaneous threads were open for voting: three contained the losing pictures from past contests, while the fourth held new contestants, to make 50 pictures in all. A record number of votes were cast in the final round, and Shadow Assassin was declared the winner by one single vote. In November 2008, a Hall of Fame Championship Tournament was held over four weeks, pitting all the Hall of Fame pictures to date (approximately 200) against each other in a single-elimination tournament. Using the poll system at SC4D, all members of the community were given a certain number of votes depending on which round of the tournament was being held, and as each round progressed, a larger number of pictures were eliminated. The tournament was won by Cockatoo-210893. Outside of SC4D, the picture contest has been replicated multiple times with varying levels of success. To date, a picture competition similar to the one on SC4D has been attempted on six other sites. Perhaps the most successful of these is located on SimForum.de. The rules of this contest are generally the same, except that a picture must win five straight round to enter the Hall of Fame as opposed to three. It was started in January 2008, and has since kept up activity comparable to the original contest. A fairly active contest has was also set up on The Planning Pages, where Masochist was an admininistrator and moderated the game. The rules on TPP were slightly different; for example, it only took 7 votes to win a round. There has also been a Grand Tournament set-up on the site (headed by Travis). After TPP's merger with SimVision, the content was discontinued. On Simtropolis, the idea was pitched to general enthusiasm, but it has yet to find root. SimCity Mild Enthusiasm and SimCity Place also both have competitions on their sites, though they see less activity than that of SC4D. An automatic competition system was set up by JoeST on his webspace as part of his web tool set. This system allowed members to directly upload their picture to the space, and used mySQL and PHP to tally scores and update the Hall of Fame. It is still available here, though you need an account to use it and view the Hall of Fame. This page was last modified on 15 July 2009, at 07:12. This page has been accessed 23,263 times.